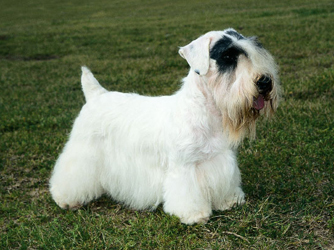 The Sealyham was developed in Britain from a range of terriers . the aim was to produce a small , powerfully built dog that would take on otters and badgers above ground , below ground and in water . it excelled in this role , and was an immensely popular dog in the early 20th century . today , redundant from the job it was originally bred for the sealyham is seldom seen , and has made the transition to show ring with only partial success . although their spirited personalities are attractive and they make good watchdogs , these dogs tends to be territorial and often aggressive towards other dogs . males in particular can be challenge to train . the dog’s wiry coat is kept at its best by stripping , which may need to be done professionally .